Lead poisoning is invisible and 100 percent preventable. Over 80 percent of all homes built before 1978 in the U.S. contain lead-based paint. The primary source of lead exposure is through leaded dust generated from deteriorating lead-based paint. Chipping, flaking, peeling paint or lead-based paint can generate invisible leaded dust that can cause serious permanent damage to children, pregnant women and adults. People can become lead poisoned by breathing or swallowing lead dust. Waste Management conducts investigations of reports of lead poisoning in children under 6 years of age. Certified Lead Risk Assessors inspect homes for potential lead risks from exposure to lead-based paint, dust, soil, or water. View this Lead Poisoning Fact Sheet in English for more information. Para más información sobre el Envenenamiento por Plomo vea esta hoja de información en Español. 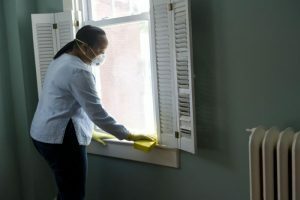 The Ohio Department of Health (ODH) lead program has funding to remove lead paint hazards from homes built before 1978. 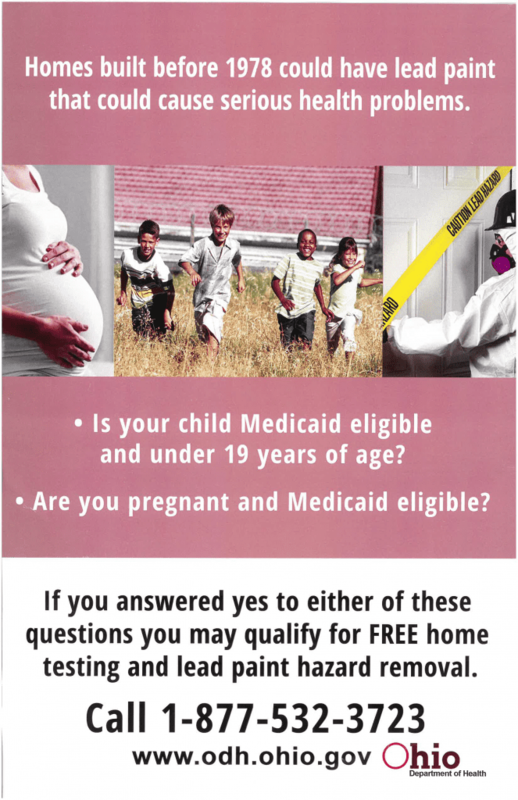 The goal is to help protect families with Medicaid eligible children and/or Medicaid eligible pregnant women against the dangers of lead paint hazards. Call 1-877-532-3723 for more information. Hamilton County Public Health offers free paint chip testing. Click this link for more information. When an elevated blood lead level (>10 ug/dl) in a child under 6 years old is identified, this triggers the need for a lead risk assessment to determine what sources of lead exposure exists in the home. The risk of lead contamination is primarily found in homes built prior to 1978 that are in poor condition. Children 6 years of age or younger are most at risk from the presence of lead due to their behavior at this early age. For example, babies and young children often put their hands and other objects in their mouths. These objects can have lead dust on them. A certified Lead Risk Assessor visits the premises to check for the presence of lead hazards from potential sources such as lead-based paint, which may be present in dust and soil. Lead can also be found in older water systems containing lead pipes. The lead risk assessor determines potential exposures of lead during the assessment by performing a comprehensive analysis of all possible sources. A Health Educator accompanies the Lead Risk Assessor to provide education about the health risks associated with lead exposure and tips on how to limit the effects of lead exposure, including hand hygiene, cleaning and nutritional information. Please click this link to view photos of common sources of lead from residential property. Hamilton County Public Health loans HEPA vacuum cleaners at no charge ($100 refundable deposit required) to assist property owners with lead cleanup and removal. Please call the Health District’s Waste Management Division at (513) 946-7879 for more information. Please click this link to view Lead Hazard Control Orders. Please click this link to search for a licensed lead abatement contractor.